C. fortunei Hooibr. ex Otto & Dietr. Cryptomeria japonica var. sinensis - (fortunii) Native of Yunnan China. Tree, growth more open than the type, branches more slender, more nodding, needle longer and thinner. Zone 7. Cedar Lodge text. A selection that has soft juvenile foliage. This cultivar is yellowish green in summer and a most unusual burnished ‘antique’ gold in winter. Stands all extremes of growing conditions but especially high rainfall areas that are well drained. Dislikes salt laden winds. Quick growing. 5.5 metres high x 2.5 metres wide in 10 years in our Nursery/Garden. Zone 5. Cedar Lodge text. Cryptomeria japonica 'Araucarioides' - A horticultural curiosity that begins life as a single stem. In a few years the plant produces clusters of branchlets on its branch tips. Where growth is slower than at our nursery, it is a very attractive but unusual bush. Stands all extremes of growing conditions but especially good in high rainfall areas that are well drained. 1.3 metres high x 1.4 metres wide in 10 years in our Nursery/Garden. Zone 5. Cedar Lodge text. A dwarf evergreen conifer with compressed green foliage. Attractive in a container or small garden. Prefers sun/partial shade in well-drained soil. 1.5' tall x 1.5' wide in 10 years. Hardy to -20 degrees. USDA zone 5. Buchholz text. Another unusual seedlings found by Cedar Lodge locally in 1989. Dark green irregular fine foliage forming a clustered loose pyramidal plant. Similar to Cryptomeria japonica ‘Bandai sugi’ but much finer branching. 1.3 metre high x 1.1metres wide in 10 years in our Nursery/Garden. Cedar Lodge text. Pyramidale boom met een open structuur .De kleur is geelgroen door de verspreide gele naalden die in de zomer haast gelijk zijn als in de winter maar is minder geel dan C. j. 'Sekkan. Is wel zeer winterhard. In 1937 is deze cultivar spontaan uit zaad ontstaan in het Pinetum 'Blijdenstein' te Hilversum. Hulsdonk text. Cryptomeria japonica 'Bandai-Sugi' - Deep green, irregular branching. A charming artistic rockery plant. Foliage slightly tinged with brown in winter. Stands all extremes of growing conditions but especially good in high rainfall areas that are well drained. Irregular, a natural Bonsai.1 metres high x 60 cm wide in 10 years in our Nursery/Garden. Zone 5. Cedar Lodge text. Cryptomeria japonica 'Beaumonts' - A very fine leafed form of the species. Light green in summer turning a slight fawn colour in winter. A slow growing shrub. Stands all extremes of growing conditions but especially good in high rainfall areas that are well drained. 2 metres high x 1.8 metres wide in 10 years in our Nursery/Garden. Zone 5. Cedar Lodge text. Birodo-sugi 1909 Hort. JPN /Nana/ Beissn. This is a dwarf and globose form of Japanese Cedar that is more upright than wide, with a dense rounded crown. The soft dark green foliage becomes burnished and bronzed during the winter months, with purplish tones also. It is probably the same plant known to some as ‘Compressa’. Zone 6. Howse text. Plants grow vigorously in youth, until they attain a height of 4-6'; then the growth rate slows and plants fill in with more compact foliage and branches. The light-green, new growth ages to a deep, dark-green and in winter maintains the darkest green–almost black–of all Cryptomerias, hence the name. Iseli text. A densely upright conical plant with light green nodding new growth that ages to a very deep green. Buchholz considers it one of the best dwarf cultivars. Arrowhead text. This broad pyramidal form of Japanese Cedar is dense and congested. Zone 6. Howse text. Breed piramidaal en tot 2-3 m hoog.Compact door de vele korte Bolvormig tot breed piramidaal , twijgjes van 5 tot 10 cm lang. In Bolvormig tot breed piramidaal ,in de zomer lichtgroen en in de winter groen met lichtbruin Wordt tot 2-3 m hoog .In 1978 door J.b.b. Tromp uit Frankrijk geimporteerd. De plant werd op bescheiden schaal gekweekt door H.G. Benckhuysen en Zonen te Boskoop. Is gevonden in 1968 in Frankrijk door S.A. Minier uit Angers Fr. Hulsdonk text. Brede piramidale boom.Deze snel groeiende cultivar is grijsgroen en de topjes zijn gebogen en hebben de vorm van kleine kegeltjes, die afhankelijk van het seizoen, bruin zijn gekleurd. Kas Koemans had deze onder de naam C.j.'Jindai'. Maar toen deze is onderscheide, is gekozen voor de naam 'Buckiscope' en dit is de oude naam van Boskoop. Hulsdonk text. Very similar to Cryptomeria japonica ’Egmont’ but smaller- slower growing with a narrow upright growth habit. Used as a shelter or hedging tree or a medium to large specimen. 10 year height approximately 5 metres. Cedar Lodge text. Compacte dichte eivorm. Groen loof, in de winter met een bruine gloed. Na 10 jaar circa 2 meter hoog en 1.5 meter doorsnee. Hulsdonk text. C. japonica lobbii compacta Hort. Cryptomeria japonica 'Compacta Nana' - Origin Eastwood Hill, Gisborne. An historic plant growing to 4 - 5 metres high with a width of 3 metres. Stands all extremes of growing conditions but especially good in high rainfall areas that are well drained. Considered a dwarf form in its early years, broadly conical with rounded apex. Zone 5. Cedar Lodge text. Cryptomeria japonica 'Compressa' - Similar to but smaller and softer than 'Vilmoriniana'. This cultivar has an even rounded appearance. 'Compressa' is more purple in winter. Stands all extremes of growing conditions but especially good in high rainfall areas that are well drained. Round to Oval shape. 65 cm high x 60 cm wide in 10 years in our Nursery/Garden. Zone 5. Cedar Lodge text. A dwarf variety of Japanese Cedar. Leaves a yellow- green. Conical upright plant growing 2-4 inches a year. Stanley text. Cryptomeria japonica 'Cristata' - Yet another curiosity, characterised by curious cockscomb-like growths that appear in otherwise normal foliage. Stands all extremes of growing conditions but especially good in high rainfall areas that are well drained. Develops into a conical tree. 2 metres high x 1.2 metres wide in 10 years in our Nursery/Garden. Zone 5. Cedar Lodge text. Cupressa 1972 Hohman USA /Compressa/? An upright evergreen conifer with rich jade-green foliage. Forms a broad, dense small tree. Attractive bronzing in winter. Prefers sun/partial shade in well-drained soil. 8' tall x 5' wide in 10 years. Hardy to -20 degrees. USDA zone 5. Buchholz text. Nieuwe heksenbezem uit Cryptomeria arucarioides. Gevonden in een pinetum in Nederland. De plant is venoemd naar de vinder van deze heksen bezem. In 2004 zijn de eerste planten in omloop gekomen. Hulsdonk text. Compacte, zuilvormige tot piramidale boom met rechte stam, zeer regelmatig vertakt,topjes meestal recht overeind, uiteinden op kegeltjes gelijkend. Is al jaren bij Kuijf te Boskoop in cultuur onder de naam 'Jindai' Vermoedelijk is deze hieruit als sport ontstaan. In 1987 kreeg hij de naam. Een erg op gelijkende cultivar is 'Buckiscope'. Hulsdonk text. This form was selected for its outstanding qualities. The plant showed exceptional form, branching, vigor and hardiness. Cryptomeria japonica 'Egmont'® - Japanese Cedar. Clonal selection by Cedar Lodge shows superior form, wind hardiness and growth rate. Hardy to all but severe coastal conditions. Grows well in a wide variety of situations including great tolerance of high rainfall areas. Will thrive in good rich loams, but will also tolerate a wide range of soils even in high rainfall areas as long as there is reasonable drainage. Cryptomeria will stand strong winds and severe cold. Performs particularly well on the higher, colder, wetter country close to Mt. Egmont (& other similar sites). It trims very well. Growth rate is moderately fast, it is disease resistant and stable (Toppling). A tall narrow tree. Approx. 10 year height 7 metres growing in our Nursery/Garden. Zone 5. Cedar Lodge text. Cryptomeria japonica 'Elegans' - Dense bronze-green in summer turning rich purple in winter. Stands all extremes of growing conditions but especially good in high rainfall areas that are well drained. Upright, bushy, as an older tree - often leaning one way. 4 metres high x 1.5 metres wide in 10 years in our Nursery/Garden. Zone 5. Cedar Lodge text. Cryptomeria japonica 'Elegans Aurea' - Dense light green foliage. In cold climates this foliage turns yellowish in winter. Very beautiful soft foliage with weeping tips. Stands all extremes of growing conditions but especially good in high rainfall areas that are well drained. Erect bushy habit. 2.5 metres high x 1.4 metres wide in 5 years. Zone 5. Cedar Lodge text. Cryptomeria japonica 'Elegans Compacta' - A smaller version of Crypt. jap. 'Elegans'. Turns brownish in winter rather than purple. Reasonably fast growth. More suitable for average sized garden. Stands all extremes of growing conditions but especially good in high rainfall areas that are well drained. Grows straight. 6 metres high x 3 metres wide in 10 years in our Nursery/Garden. Zone 5. Cedar Lodge text. Cryptomeria japonica 'Elegans Nana' - Very compact shrub. Green in summer, brownish red in winter. Growth even but with very small stiff protrusions on it. This cultivar is not in any reference book. Stands all extremes of growing conditions but especially good in high rainfall areas that are well drained. Very compact, squat cushion shape. 80 cm high x 1 metre wide in 10 years in our Nursery/Garden. Zone 5. Cedar Lodge text. Een compacte smal opgaande boom. Aanvankelijk een dwergvorm later hoger met opeengehoopte twijgjes Blijft ook in de winter een mooie groene kleur houden ,soms een beetje bronskleurig. Korte stevige twijgen. In 1978 naar Nederland gehaald maar was in Japan al langer bekend. Hulsdonk text. This densely pyramidal Japanese cedar vigorously grows to a mature height of 8-10 feet tall by about 5-6 feet wide and sports decorative male and female cones one-half inch long. Laufer text. A dense, dome-shaped evergreen conifer with short, interesting whip-like green branchlets. Foliage has an attractive bronze-red blush in winter. Prefers sun/partial shade in well-drained soil. 5' tall x 4' wide in 10 years. Hardy to -20 degrees. USDA zone 5. Buchholz text. Cryptomeria japonica 'Globosa Nana' - Rich green foliage. Clothed right to ground level. Slow to develop its true beauty. Worthy of planting in any garden but preferably where it can stay past its 10 year size as it is such a wonderful plant. Stands all extremes of growing conditions but especially good in high rainfall areas that are well drained. Beautiful rounded compact bush. 1 m all around in 10 years in our Nursery/Garden. Zone 5. Cedar Lodge text. A miniature evergreen conifer with short, light yellow foliage. In Oregon foliage becomes practically white when humidless temperatures reach 100 degrees. Prefers sun/partial shade in well-drained soil. 1' tall x 1' wide in 10 years. Hardy to -10 degrees. USDA zone 6. Buchholz text. wide in 10 years in our Nursery/Garden. Cedar Lodge text. In de volle zon gele twijgen. Heel opvallend . Is zeker geen dwerg, maar door te snoeien is deze plant compact te houden. De plant is iets minder geel dan b.v. C. j. Barabits Gold, maar heeft ook minder last van verbranden. Hulsdonk text. A unique, broad upright evergreen conifer with tufts of dense green foliage along stems. Prefers sun/partial shade in well-drained soil. 8' tall x 6' wide in 10 years. Hardy to -20 degrees. USDA zone 5. Buchholz text. Attractively coloured lightly purple and green during summer and turning metallic bronze/purple during winter. Can be trimmed to shape and required size. Lovely upright cone. 4.5 metres high x 2.5 metres wide in 10 years in our Nursery/Garden. Cedar Lodge text. This is a dwarf globose bush. It appears to me to be identical to ‘Osaka-tama’. Both plants are dense and globose, with green foliage that becomes bronzed with exposed to winter cold. Zone 6. Howse text. Cryptomeria japonica 'Jindai-Sugi' - A pleasant shrub, retaining its green colour throughout most of the year. May turn brownish in winter. Stands all extremes of growing conditions but especially good in high rainfall areas that are well drained. Oval. 1.5 m high x 80 cm wide in 10 years in our Nursery/Garden. Zone 5. Cedar Lodge text. Jinday Liam is als heksenbezem gevonden in de Jinday. De hoogte is na 10 jaar ongeveer 60 en 50-60 cm breed. De plant is benaamd door de collectie houder uit Boskoop. Hulsdonk text. Lush, vibrant green foliage on this large, shrubby cultivar looks like plumes of smoke. Growth Rate: 2-4" HxW@10yrs: 5'x3.5'. Brent Markus text. Sam Pratt USA photo 2013 VW Bug? Als heksenbezem gevonden ,maar is zeker geen super dwerg. Beschrijving volgt later. Hulsdonk text. Deze plant is ontstaan in Duitsland' als zaailing van C j, Gracilis. De eerste griffels werden mij in 2006 toegestuurd, met het verzoek om de planten te vermeerderen. In de zomer en winter lichtgroen tot geelgroene naalden. Smaller en alle takken sterk omhoog gericht, en is minder scherp van naald dan C.j. Gracilis. Hulsdonk text. A dwarf cristate form it looks like a broom of cristata but finer textured, this originated in Ireland around 1966. Arrowhead text. Cryptomeria japonica 'Knaptonensis' - Congested creamy white foliage. A true miniature. A real collectors item. Must be grown in complete shade and shelter, otherwise it will sunburn. Especially good in high rainfall areas that are well drained. 35 cm high x 30 cm wide in 10 years in our Nursery/Garden. Zone 5. Cedar Lodge text. Een cultivar met een dwergvormige groeiwijze. De plant is uit Japan geinporteerd in 1984 en is in cultuur bij L Konijn te Ederveen onder de naam 'Kohui-yatsubusa' De juiste naam is 'Kohui'. In Japan is deze cultivar al langer bekend. Hulsdonk text. A dwarf form of Japanese Cedar. All foliage is a net-like and juvenile. Leaves green with a little purple in winter. Like `Tansu' but squatter. Grows about 4 inches a year. First imported from Japan in 1974 by Wansdyke Nurseries, Devizes, Wilts, U.K.. Stanley text. Hawksridge Farms in Hickory, North Carolina. Cox text. A slow-growing dense evergreen conifer with a broadly-pyramidal form. Foliage is dark olive-green with slight bronzing in winter. Prefers sun/partial shade in well-drained soil. 2' tall x 2' wide in 10 years. Hardy to -20 degrees. USDA zone 5. Buchholz text. A new selection by Cedar Lodge. A large specimen tree of typical Cryptomeria japonica form. It is distinguished by pale lemon foliage. The colour is enhanced with colder temperatures i.e. brilliant winter colour. Quick growing. 7 metres high x 2.5 metres wide in 10 years in our Nursery/Garden. Cedar Lodge text. Ontstaan als heksenbezem in C. j. 'Gracilis'. Gevonden door Wout Huizer te Boskoop, Nederland, en in 1992 door hem in de handel gebracht. Lage bolvormige plant met frisgroen loof. In 10 jaar 60-70 cm. breed en ± 60 cm. hoog. Ook in de winter mooi groen. Geschikt voor de kleine tuin, heide- of rotstuin. Ook geschikt om op een stam te kweken. Hulsdonk text. A dwarf evergreen conifer with a dense, compact round form. Foliage is gray-green and very compressed. A new selection from Europe. Prefers sun/partial shade in well-drained soil. 3' tall x 3' wide in 10 years. Hardy to -20 degrees. USDA zone 5. Buchholz text. A dwarf evergreen conifer selected in Holland. Foliage is soft and bright green and has a neat look. Prefers sun/partial shade in well-drained soil. 2' tall x 3' wide in 10 years. Hardy to -20 degrees. USDA zone 5. Buchholz text. Cryptomeria japonica 'Littleworth Dwarf' - Found by H.J. Welch in England. Green all year. Moderate growth rate. Not a dwarf in N.Z. Stands all extremes of growing conditions but especially good in high rainfall areas that are well drained. Conical form. 3.5 metres high x 2.5 metres wide in 10 years in our Nursery/Garden. Zone 5. Cedar Lodge text. Cryptomeria japonica 'Lobbii' - Slower growing than the species and dense, more compact foliage. Stands all extremes of growing conditions but especially good in high rainfall areas that are well drained. Ideal for a large hedge or slow growing shelter belt. A conical, symmetrical tree. Very neat. 4.5 metres high x 2 metres wide in 10 years in our Nursery/Garden. Zone 5. Cedar Lodge text. A plant of muddled nomenclature the name 'Lobbii Nana' which is in general use is considered invalid by Welch. Apparently there is more than one „compacta nana‟ or whatever circulating, ours forms a medium sized ball with pincushion new growth. Arrowhead text. Is ontstaan in 1985 uit een doorgeschoten tak in de Cryptomeria japonica 'Spiraliter Falcata'. Het is een losse grillige groeier die op zeer jonge leeftijd massa's kegels draagd welke heel goed geschikt zijn om te gebruiken bij bloemschikken. Is benaamd door de Boskoopse collectie houder. Hulsdonk text. Tightly held needles on numerous branchlets give this broad, upright conifer a dense appearance that stays green throughout the year. Propagated and named by Ed Rezek from a witch's broom on a tree in Mr. Mignone's garden. Iseli text. This is a low mounded form of Japanese Cedar with a dense habit. It has juvenile foliage that is plumose, but then becomes adult and more scale-like. It has wonderful dark burnished tones and orange tones during the winter months, mottled with the dark green interior foliage. Zone 6. Howse text. Cryptomeria japonica 'Monstrosa Nana' - Irregular bunches of congested foliage. Turns bronze/purple in winter. Stands all extremes of growing conditions but especially good in high rainfall areas that are well drained. Compact round bush. 1 metre all around in 10 years in our Nursery/Garden. Zone 5. Cedar Lodge text. 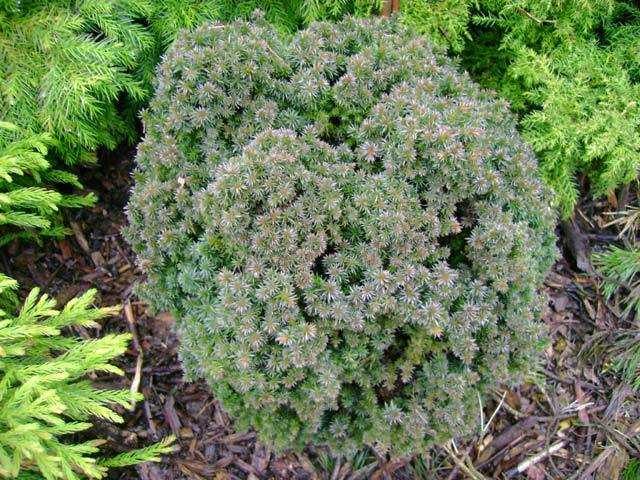 A dwarf, mounding conifer with soft bright green foliage that becomes bronze in cold weather. Prefers sun/partial shade in well-drained soil. 2' tall x 3' wide in 10 years. Hardy to -20 degrees. USDA zone 5. Buchholz text. Ontstaan als zaailing in Australië. Langzame groeier met een paddestoelachtige groeiwijze. In 10 jaar 80-100 cm. breed en 60-80 cm. hoog. Loof groen met bruine zweem, in de winter roodbruin tot lila getint. Hulsdonk text. A dwarf rounded ball. Leaves are green. Plant a round ball but looks airy. Grows about 2-4 inches a year. Stanley text. A dwarf variegated form of Japanese Cedar. White leaves in a conical upright form of juvenile foliage. Leaves are entirely white! Plant grows faster than the variety 'Knaptonensis' and can take a little more sun. Plant found as early in trade as 1868. Stanley text. C. japonica var. argenteovariegata Senecl. Mooi boompje met fris groene naalden die in de winter bijna niet naar brons verkleuren . Heeft zeer korte naaldjes en geeft vele zijtakjes die erg verspreid staan met op elk takje een mooi rond toefje met naaldjes. De boom heeft een doorzichtige structuur. Herkomst is Japan. De plant is sinds 1980 in Nederland in cultuur. Hulsdonk text. 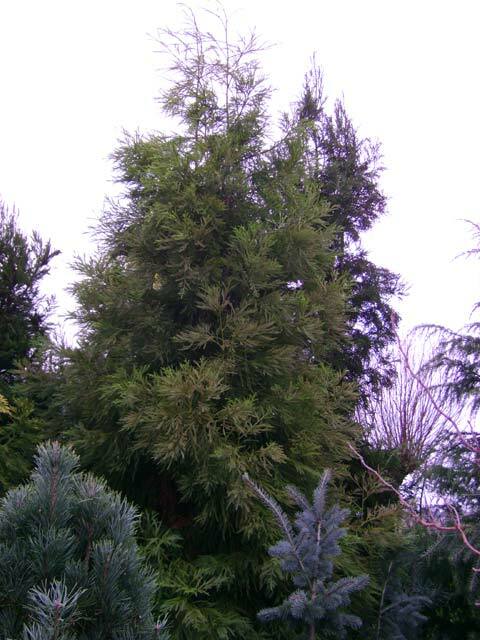 A broad, pyramidal, dwarf conifer with gray-green, refined foliage which turns a lovely soft bronze purple in winter. Prefers sun/partial shade in well-drained soil. 2' tall x 1.5' wide in 10 years. Hardy to -20 degrees. USDA zone 5. Buchholz text. Mutant uit C. j. 'Tenzan' maar met een grovere en meer grillige groeiwijze. Ook mooi compact groeiend. Geschikt voor de rotstuin. Hulsdonk text. A dwarf conifer with light green, refined foliage. ‘Pom Pom’ displays a rounded habit when young, but will eventually form a leader. Prefers sun/partial shade in well-drained soil. 2’ tall x 2’ wide in 10 years. Hardy to -20 degrees. USDA zone 5. Buchholz text. 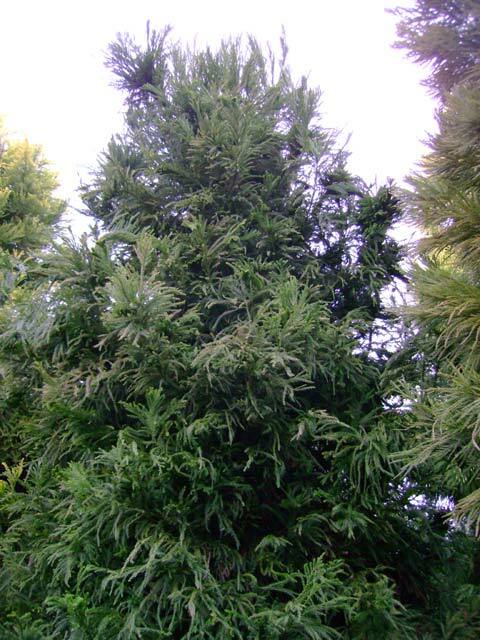 A smaller growing clone of Japanese Cedar found by Cedar Lodge and deemed commendable as a medium growth rate plant. Bushy habit, round top with only a slight colour change in winter. An ideal garden specimen or hedge. Stands all extremes of growing conditions-especially good in high rainfall areas that are well drained. Oval shape. 3 metres high x 1.5 metres wide in 10 years in our Nursery/Garden. Cedar Lodge text. This may well be the plant long grown as „nana‟, a flat-topped bush with congested „Tansu‟ like foliage with very short annual growth. Arrowhead text. An upright, vigorous conifer with narrow, thread-like green foliage. Prefers full sun in well-drained soil. 8' tall x 4' wide in 10 years. Hardy to -20 degrees. USDA zone 5. Buchholz text. An upright, fast-growing conifer with wonderful, spiraling, twisted green foliage. A marvelous accent plant for the garden. Rasen means "barber-pole" in Japanese. Prefers full sun in well-drained soil. 8' tall x 3' wide in 10 years. Hardy to -20 degrees. USDA zone 5. Buchholz text. The unusual texture and rich jade-green of the needles give this handsome form of the species a compelling look during the growing season. Its tightly held foliage, which turns striking purple-bronze in winter, gives branches a well-defined, formal appearance. Iseli text. This dense conifer was found as a witch's broom on 'Rein's Dense Jade' at the Arnold Arboretum. It has unique, fasciated foliage and a fairly slow, somewhat globose growth habit. Brent Markus text. A dwarf rounded globe. Leaves are light-green. Stems are like whips with awl like scales. Very odd. Grows 2-3 inches a year. Found by Ed Rezek of Malverne, New York. Stanley text. Het is een bossige compacte plant, goed vertakkende met hele dunne twijgjes. Na 10 jaar ongeveer 60 cm. hoog. De plant is als onbenaamde cultivar uit Deviezes (Eng. )gekomen,en wel uit de collectie van H.J. Welsh. En is toen door de Nederlandse Collectie houder uit Boskoop, op naam gezet. Hulsdonk text. A miniature variety of Japanese Cedar. A flat-round minature with green leaves. Flat sprays with balanced stems that turn reddish in winter. Plant found and introduced by Edsel Woods, Aurora, Oregon. Stanley text. perfect in a trough. Arrowhead text. A dwarf conifer with fine dark-green foliage and congested growth habit. The name means "green ball" in Japanese. Prefers sun/partial shade in well-drained soil. 2' tall x 2' wide in 10 years. Hardy to -20 degrees. USDA zone 5. Buchholz text. New growth emerges with a beautiful yellow-white color, contrasting nicely with the dark-green color of the older foliage. This cultivar develops into a broad, upright tree. Growth Rate: 12-15" HxW@10yrs: 12'x6'. Brent Markus text. Cryptomeria japonica 'Sekkan Sugi' - An outstanding specimen. Semi pendulous branches. Foliage light cream almost white especially in spring and early summer. Slightly bronzed in winter. Needs full sun - very rarely burns in sunny conditions. Stands all extremes of growing conditions but especially good in high rainfall areas that are well drained. Oval. 3.5 metres high x 2.3 metres wide in 10 years in our Nursery/Garden. Zone 5. Cedar Lodge text. A broad evergreen conifer eventually forming a dense upright tree. Soft green leaves spiral around the stems. Curious but very garden worthy; introduced from Japan in 1860. Prefers sun/partial shade in well-drained soil. 5' tall x 5' wide in 10 years. Hardy to -20 degrees. USDA zone 5. Buchholz text. Cryptomeria japonica 'Spiraliter Falcater' - Dwarf form. Finer foliage than 'Spiralis'. Growth rate medium. Stands all extremes of growing conditions but especially good in high rainfall areas that are well drained. Round ball. 1.8 metres high x 1.7 metres wide in 10 years in our Nursery/Garden. Zone 5. Cedar Lodge text. This has superior, fine textured foliage, small enough for troughs and exceptionally hardy. 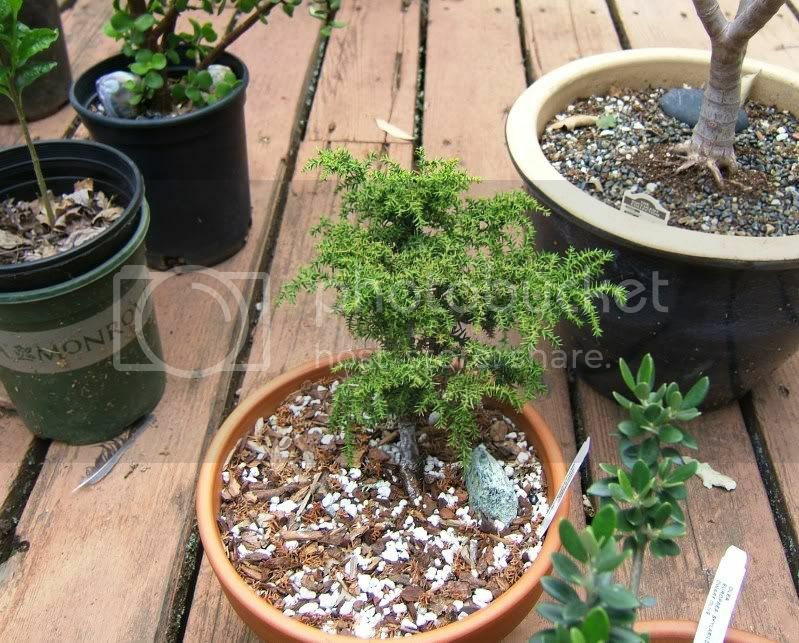 The irregular upright habit is especially well suited for bonsai reaching 15" after a great many years. It was originally introduced by Iseli in 1982 as ’Yatsubusa’. Arrowhead text. C. japonica var. gracilis Hort. Cryptomeria japonica 'Tensan' - One of the tightest conifers we have seen. A real miniature. Stands all extremes of growing conditions but especially good in high rainfall areas that are well drained. Shaped like a flattened stone. 20 cm high x 35 cm wide in 10 years in our Nursery/Garden. Zone 5. Cedar Lodge text. cream fading to yellow green by fall, rusty red tints in winter. A very very tall tree with very pendulous branches. This tree is very narrow for its height. We are trialling it now and in time it may prove excellent as a narrow shelter belt - trimming being unnecessary. Stands all extremes of growing conditions but especially good in high rainfall areas that are well drained. Cedar Lodge text. Mutant uit 'Jindai' met dezelfde habitis, maar deze cultivar heeft gele toppen, vooral in de winter. Het loof verkleurd in de winter roodbruin wat een mooi effect geeft met de gele toppen. Gevonden door kwekerij van den Top uit Barneveld. Hulsdonk text. A dwarf, yellow ball variety of Japanese Cedar. Leaves are light yellow. Plant not as tight as you would like, but good color. Grows 2-4 inches a year. Perfect round ball, nice for rock gardens and patio containers. Stanley text. Cryptomeria japonica 'Vilmoriniana' - One of the most popular rock garden subjects. Neat, compact, dense. Turns purplish in winter. Stands all extremes of growing conditions but especially good in high rainfall areas that are well drained. 40 cm high x 50 cm wide in 10 years in our Nursery/Garden. Zone 5. Cedar Lodge text. A dwarf upright. Leaves are coarse and green. In winter tree turns bronze. Plant will reach 6 ft.. in its life time. Stanley text. The new twigs of this dwarf Japanese Cedar are brushed lightly with yellow in spring; then they change to and stay bright green the rest of the year, without bronzing in winter. Short, finely textured foliage, gathered randomly in clusters at the crown, make the upright, pyramidal bush dense with age. Protect from drying winds. Iseli text. A miniature conifer with fine, light-green foliage and congested growth habit. Prefers sun/partial shade in well-drained soil. 2' tall x 2' wide in 10 years. Hardy to -20 degrees. USDA zone 5. Buchholz text. C. japonica spiralis elongata Hort. C. japonica spiraliter falcata Carr. A conical, upright conifer with bright green summer foliage that becomes slightly bronze-green in cold weather. Grows as fast as any Japanese Cedar. Prefers sun/partial shade in well-drained soil. 12' tall x 6' wide in 10 years. Hardy to -20 degrees. USDA zone 5. Buchholz text. (Japan, ingevoerd voor 1968) Werd in 1976 vanuit het National Arboretum Washington D.C. geïmporteerd door F.J. Grootendorst. Hulsdonk text. Cunninghamia konishii - Formosan cunninghamia. Native of Taiwan. (Formosa.) A large tree. Not hardy to harsh salt wind. Known to like hot dry summers and very cold winters. Moderately tall tree. Bark reddish brown and scented. Growing well here. 6 metres high x 4 metres wide in 10 years in our Nursery/Garden. Zone 8. Cedar Lodge text. Globose to bun-shaped, dwarf, 1.5 in. growth per year. A Z6 klímára szelektált tajvani csodafenyő, névadás később. Cunninghamia lanceolata - China Fir. A tall graceful tree of character that would serve well as a lawn specimen. A native of Southern China. Also likes hot dry summers and very cold winters. Does well here out of the worst salt laden winds. 7.5 metres high x 3.5 metres wide in 10 years in our Nursery/Garden. Zone 8. Cedar Lodge text. Cunninghamia lanceolata 'Glauca' - Blue China Fir. Tall graceful tree. Serves well as lawn specimen. A beautiful blue. 'Glauca' is said to be more hardy to cold than the species. It seems to stand the salt wind better too. Approx. 4 metres high x 3 metres wide at base in 10 years in our Nursery/Garden. Zone 8. Cedar Lodge text. A dwarf variety of Chinese Fir. All leaves are smaller than species. Green and about 3/4 of an inch long. Stems grow about 4-6 inches a year. Stanley text. A very blue selection of seed. Flat top hardy (Zone 6) dwarf seedling. Igazi törpe növésű , lapított alakú magonc szelekció, több mint 10 éves, eddig fagykár nem érte (takaratlanul ). A flat growing plant with exquisite powder blue wickedly armed foliage. It is the focal point of our big tufa garden and so far has shown no inclination to leader. Arrowhead text. A blue variety of Chinese Fir. A selected variety with very conical shape and striking blue color. Tighter and bluer than `Glauca'. Introduced from the Raulston Arboretum we believe. Stanley text. a very hardy green clone. példány szaporítványa, mely az 1929-es kemény telet is túlélte. A broom with rather short deep green needles and irregular growth. This is much more irregular and larger growing than „Little Leo‟, there is a good photo in the Raulston slide collection. Arrowhead text. Known as Chinese Fir. Leaves are steel blue. Huge triangle leaves to 2 1/2 inches long. Can take shade or full sun. This tree is in question,Taxonomist believe it to be just a sub-species of Cunninghamia lanceolata. Tree to 50 ft. Stanley text. Cupressus leylandii Dall. & Jacks. Der Wuchs dieses neuen Klons ist buschig und breit. sich gut und kann Jungblattwerk an seiner Basis zeigen. Cupressocyparis leylandii 'Castlewellan Gold' - (Cupressus macrocarpa x Chamaecyparis nootkatensis ) - A garden specimen as well as a shelter tree. A very strong grower. Needs free draining situation. A fast growing lemon-gold evergreen, foliage fern-like. A reasonably narrow upright form. Will stand strong moderately salt laden winds. Responds well to trimming but care must be taken not to trim back too hard. A very desirable decorative shelter. 6 metres high x 3.5 metres wide in 10 years in our Nursery/Garden. Zone 7. Cedar Lodge text. A 'Haggerston Grey' testvére, hozzá nagyon hasonlít, de nála lényegesen erősebben növő klón (az angol kertészek réme). Orlóci text. Ezüstösszürke szomorú, sok porzótobozt fejlesztő fajta. Anyanövénye a Fota Arborétumban IRL ’Pendula’ néven bemutatott. A sport of Haggerston Grey with lemon foliage, found in the U.K. in 1977 it holds its color well forming a golden obelisk that tapers little until very near the top. A surprisingly hardy gold form that was introduced from Holland in 1985, it is moderately slow growing and considered the best by Van Hoey Smith. Ragyogó sárga lombozatával és fiatalon is sűrű növekedésével hívja fel magára figyelmünket. Ezt a sárga színt a téli napsugárzás sem perzseli meg. Az alapfajnál viszonylag lassabb növekedésű, de annál igényesebb és fagyérzékenyebb is. A hibridciprusok fagyérzékenysége elsősorban a vesszők őszi beérésétől függ, ezért mindig napos szabad állásba és szárazabb nem fagyzugos helyre ültessük. Saját honosítású holland fajta. Orlóci text. A 'Leighton Green' helyettesítésére a leginkább ajánlott fajta. Erős növekedésű, zárt koronájú, oszlopos alakú, világoszöld lombozatú fajta. Hajtásai erősen növők és gyengén spirális állásúak. Fiatalon lazább, de idősödve besűrűsödő koronát nevel. Jó télálló és a szárazságot is elviselő fajta. Saját honosítású fajta. Orlóci text. Az 1970-es években hazánkba elsőként bekerült változat. Mára az egyik legelterjedtebb sövénynövényünké vált. Ez elsősorban gyors növekedésének és igénytelenségének köszönhető. Lombozata szürkészöld, ágrendszere gyengén csavarodó, a korona szélesebb tojás alakú. Idősebb korában a csúcs ellaposodó. Túlnyomóan tobozt hozó változat, így túlzott allergén pollentermelésétől nem kell tartanunk. Az egyik legigénytelenebb legtöbbet tűrő fajta, de csak napos helyen érzi jól magát. Szabad állásba, kisebb csoportba vagy sövénynek ültessük. Saját honosítású fajta. Orlóci text. This originated as a witches broom found growing at Hyde Hall in 1979, it forms a slow growing conical bush. Arrowhead text. Az első hibridciprusok egyike. Hagyományos növekedésű, szürkészöld lombozatú változat. Orlóci text. Cupressocyparis leylandii 'Leighton's Green' - (Cupressus macrocarpa x Chamaecyparis nootkatensis)- Extremely fast growing tall green tree. Usually planted as a shelter line but can be very useful as a hardy accent tree. Salt wind hardy. Must have a well drained situation. Broad spreading columnar habit, but early pruning appreciably reduces the ultimate width. Hardy to frost, cold and winds. 7 metres high x 4 metres wide in 10 years in our Nursery/Garden. Zone 7. Cedar Lodge text. Lassú növekedésű, fűzöld lombozatú francia fajta. Alacsony sövénynek kiváló. Orlóci text. This selection comes from the illustrated mother plant below as a goldie sport in winter. Keeps the freshgreen-lemon of the mother, and turns to gold in winters. 4 meters in 25 years with a coherent, dense habit in optimistic fresh colours. Ez az új fajta az alanti anyanövény télen aranyos színű mutánsa. Évközben tartja az anyanövény friss színeit, majd télen aranyos leplet ölt. 25 évesen 4 méter magas sűrű, összetartó ágrendszerű tünemény. to a lemonade-goldie coloured tree. Télen aranyos színt mutató, közepes növekedésű változat, mely Dömösön talált sövényről való. Selected for winter creamy-lemonade colour from sport. Grows as usual, gives a nice look in the garden. Téli változat, mely krémes-citromos színű hajtásokról készült. Nagy növésű, szép látvány a kertben. rustic goldie coloured big tree. Télen aranyos színt mutató, erőteljes növekedésű változat, mely Visegrádon talált sövényről való. Nagy fává nő, sok helyet kér, és nem való sövénynek. Cupressocyparis leylandii 'Naylor's Blue' - (Cupressus macrocarpa x Chamaecyparis nootkatensis) - Foliage grey-blue. Branches more open than 'Leighton's Green'. The more open growth habit allows greater permeability. A very graceful tree. Mostly used as Shelter Line, but would make a good garden specimen (large garden). Salt wind hardy and in need of free draining soil. 10 metres high x 5 metres wide in 10 years in our Nursery/Garden. Zone 7. Cedar Lodge text. Kékes lombszínével egyike a legszebb Leyland-ciprusoknak. Kúp alakú, kezdetben lassú, később gyors növekedésű, koronája kissé laza. Saját honosítású fajta. Orlóci text. Cupressocyparis leylandii 'Robinson's Gold' - (Formerly 'Mellow Yellow') (Cupressus macrocarpa x Chamaecyparis nootkatensis) - Similar to x Cup. ley. 'Leighton's Green' but with soft yellow foliage and slightly slower growth rate. An upright conical tree. Once again needs free draining situation. 7 metres high x 3.5 metres wide in 10 years in our Nursery/Garden. Zone 7. Cedar Lodge text. 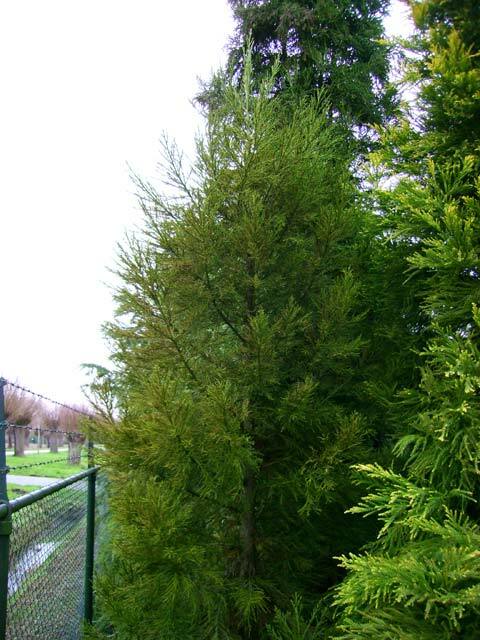 Cupressocyparis leylandii ‘Rua’ - (Cupressus macrocarpa x Chamaecyparis nootkatensis) - A NZL raised cultivar. Typical leylandii form distinguished by it’s flattened type leaf spray. If enough were propagated at any one time this cultivar could be used as a shelter line also. Free draining situation necessary. 7 metres high x 2.5 metres wide in 10 years in our Nursery/Garden. Zone 7. Cedar Lodge text. Cupressocyparis leylandii ‘Silver Dust’ - (syn. Gold Dust) (Cupressus macrocarpa x Chamaecyparis nootkatensis) - A sport from ‘Leighton’s Green’. Salt wind hardy tree of rapid growth rate. Creamy white colour in patches throughout tree. Needs a free draining site. 6 metres high x 2.5 metres wide in 10 years in our Nursery/Garden. Zone 7. Cedar Lodge text. Strong growing dense green column. Gyenge növekedésű, oszlopos alakú, zárt koronájú, sárga lombszínű fajta. Orlóci text. Cupressocyparis leylandii ‘Superl’ - (Cupressus macrocarpa x Chamaecyparis nootkatensis) x Cupressocyparis leylandii ’Superl’ is a hybrid showing considerable promise in trials at F.R.I. Rangiora. 7 metres high x 4 metres wide in 10 years. Cedar Lodge text. This hybrid was found in a Cupressus glabra ’Glauca’ seedbed. 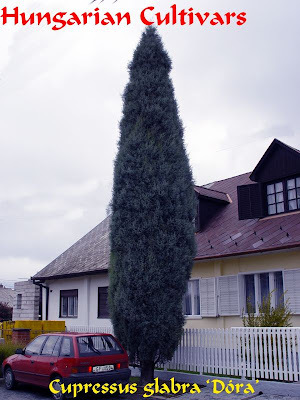 Tóth Gyula 1994-ben Cupressus glabra ’Glauca’ magvetésben találta a hibrid növényt. A Cupressus anyanövény (Gödöllői Arborétum 1994) közelében egy erősen porzó Xanthocyparis nootkatensis csoport van, így jött létre a kereszteződés. Kúp alakú, hamvas-szürkészöld színű, télállósága a Leyland-ciprusokénál jobb. 10 éves korára 6-8 m magas lesz. Anyatő Tóth Gyula faiskolájában és Pomázon látható. Orlóci László Angliából hozta e szürkés változatot, mely eltér a régebben elterjedt hazai fajtától. Magyarországon minősített fajta. Cupressocyparis ovensii - (Cupressus lusitanica x Chamaecyparis nootkatensis) - Developed in England. Fast growing shelter tree. The lusitanica parentage means only moderately salt wind resistant. Approx. 10 year height 7 metres, in our Nursery/Garden. Zone 7. Cedar Lodge text. and more dense, like ’Typ’. sűrű ágállású változatot. Magyarországon minősített fajta. C. arizonica var. bonita Lemm. C. benthami var. arizonica /Green/Mast. C. guadelupensis Sarg. not Wats. A dense, pyramid-like blue clone, 2 meters in 15 years. (C. arizonica 'Spire') Gevonden als zaailing in de Barossa Vallei, Zuid-Australië in 1980. Zone 7. Een opgaande vorm met blauw loof. De takken hangen sierlijk langs de stam naar beneden. Na 10 jaar 4-5 meter hoog. Deze cultivar is identiek aan C. a. 'Raywood Weeping'. Hulsdonk text. Open upright specimen. Growing tips white in spring and summer very attractive at this time. Quite rapid growth. 4 metres high x 3 metres wide in 10 years in our Nursery/Garden. Zone 7. Cedar Lodge text. A medium-size evergreen conifer with a pyramidal form and gracefully drooping branches. Foliage is gray-blue. Parents of this cross are Cupressus arizonica and Cupressus torulosa. Prefers full sun in well-drained soil. 10' tall x 5' wide in 10 years. Hardy to 0 degrees. USDA zone 7. Buchholz text. A golden variety of Arizonia Cypress. Plant has very golden compressed leaves. Plant is a very strong upright, not columnar but not conical either. Plant will grow about 1 ft. a year. Stanley text. Conical crown, quickly grow. Bloomy gray foliage, dense. Branchlets and very dense sprays. Very large, ovoid cones /3-3,5 cm x 2-2,5 cm/ semipersistent, mat gray when ripen, umbos barely distinguished. Bark in lilac-red-brown plates peel. Kúpos koronájú, gyors növésű. Hamvas szürke lombozat, sűrűn álló hajtások jellemzik. Nagyon nagy, ovális tobozai /3-3,5 cm x 2 -2,5 cm/ részben sokáig az ágakon maradók, fénytelen szürkék és fel nem nyílók a beérés után. A tobozpikkelyek köldökei alig emelkednek ki. A kéreg lila-vörös-barna foltokban hámlik. very wrinkled like the skin of a primordial being. Átlagos növekedésű, nagyon szabályos, karcsú kúp. Oldalvezérei nincsenek csak sok, sűrűn álló egyenrangú hajtás övezi a törzset. Kérge foszlós, nagy sötétbarna foltokban hámlik. Ezüstös lombozata erős fémes hatást kelt. Tobozai olyan ráncosak, mint egy őslény bőre. A cultivar from South Island, New Zealand. A very good blue, very fast growing. Could be used in quantity as shelter or as a single garden specimen. Graceful. Conical. 6 metres high x 4 metres wide in 10 years in our Nursery/Garden. Cedar Lodge text. A vigorous upright coniferous tree. Branches ascend and the tree is more compact than the type. Large blue-gray soccer ball-like cones add year-round interest. Prefers full sun in well-drained soil. 10' tall x 5' wide in 10 years. Hardy to -10 degrees. USDA zone 6. Discovered and introduced by the Flora Wonder(tm) Collection of Buchholz Nursery. Buchholz text. A compact form. Very blue. Drought resistant. Will stand wind and is semi coastal. Sometimes used as a shelter belt or screen. Broad cylinder. 4 metres high x 2 metres wide in 10 years in our Nursery/Garden. Zone 7. Cedar Lodge text. Blue-grey foliage, upright weeping habit. Will stand some wind but not severe salt wind. 5 metres high x 2.5 metres wide in 10 years in our Nursery/Garden. Zone 7. Cedar Lodge text. Pyramidaal groeiende vorm. Takken hangen vertikaal langs de stam naar beneden. Naalden zilverblauw. Gevonden door P.C. Nitschke, in Tanunda, Australië. Hulsdonk text. A very narrow, weeping form of Arizonia Cypress. All branches hanging down around the trunk. Leaves blue-grey. Plant will be 20 ft. tall and 4 ft. wide in 20 years. Likes drier soil. Stanley text. An Arizona Cypress that is almost a round cylinder. Leaves are bright blue. Plant will be 15 ft.. tall when 6 ft. wide in 10 years. Stanley text. összetartó korona, szívósság, télállóság –impozáns szoliter. Orlóci László számára a US Forest Service gyűjtötte a magot az élőhelyen. Vakítóan ezüstös, vöröslő foltokban leváló kérgű növény, amely fonalas hajtásrendszerével, fénylö, nagy tobozaival mutatós kerti dísz. Egg-shaped crown, very quickly growth. Bark sycamore-like, patches yellow and red. Fine, dense foliage, no lateral branches aside. Cones very small, 1-1,5 cm diameter, ovoid with petty bracts, changing from silvery white to grayish-brown. Nagyon gyors növekedésű, tojásdad koronájú. A kéreg platán-szerűen foltos, sárga és vörös. Finom, sűrű lombozat, oldalvezérek nincsenek. Tobozai nagyon kicsik, 1-1,5 cm átmérőjűek, kerekdedek jelentéktelen köldökkel. Ezüstös fehérről szürkésbarnára érnek. in South Carolina. Stanley text. A beautiful white foliaged Arizona Cypress. Plant quite columnar with white compressed stems that shot upward. Plant grows about 1 ft. a year. Very nice color for a conifer. Stanley text. Conica den Ouden 1937 FRA? cones. Bark on trunk and boughs are quick red-vine-red. This form is definitely different from Cup. glabra ‘Arctic’, which it was named when purchased. It has fine foliage and an open weeping habit. 4.5 metres high x 3 metres wide in 10 years in our Nursery/Garden. Zone 7. Cedar Lodge text. The mother plant was destroyed in 2009. Picea abies with curtain-like secondary and thirdly sprouts. Két testvérével együtt a Cupressus arizonica "Conica" magvetéséből szelektált. Nagyon vékony, fonalas, kékes-ezüstös hajtásai a térben szimmetrikusan kinyúló, felhajló csúcsú oldalvezéreken függönyszerűen csüngnek. Magasba törő, gyorsan fejlődő impozáns kúp. A hideget, szelet, havat, ólmosesőt károsodás nélkül és szabályos, ép koronát formázva viseli el. Kérge már korán díszes, mint a "Conica"-é. Regular conical habit, silvery-gray, dense foliage. Branchlets stands upward, last sprays bows down. Bark yellowish-brown-purpur patchwork. Cones with large umbos. Szabályos kúp alakú korona, ezüstös szürke lombozat. A hajtások ívesen felfelé állnak,az utolsóéves növekmények lefelé ívelnek. A kéreg sárgás-barna-bordó foltos. Tobozai nagy umbójúak. Cupressus glabra ‘Gold Pyramid’ - Heavy foliage. Gold rather than yellow. Fast growing. A very pleasant foliage form. An asset to any large garden. Wind and salt wind hardy. Ovoid shape. 6 metres high x 2 metres wide in 10 years in our Nursery/Garden. Cedar Lodge text. crown, robust growth, clima tolerant. A Kew Gardens-ben, Londonban élő növény magonca. Nagyon halvány hamvasság borítja egész lombozatát, melynek alapszíne avokádó-zöld. Szinte hengeres koronájú, hajtásainak mintázata "páfrányos" vagy a fodros petrezselyemre emlékeztet. Hatalmas, beérésig ugyancsak hamvas-kék, beérve szürkésbarna tobozai külön ékességek. Olyan színárnyalatú, amely szinte meg sem található a kertekben, tűrőképessége pedig messze átlagon felüli. A very recent Cedar Lodge selection from a batch of seedlings. Grey-green dense foliage. Formal, upright habit. Impressive measurements of 4 metres high x 1.5 metres wide in 7 years in our Nursery/Garden. Cedar Lodge text. A Cupressus arizonica ’Conica’ magonca. Hamvaskék, zárt henger , 6 m magas /2009/, talajszinten és 4 m magasságban is 60 cm átmérőjű. Elsőrendű klímatűrő. Zárt, sűrű lombozat, szél, hó, ólmoseső soha nem bontotta meg. Nevét Joschka Fischer volt német külügyminiszter, Magyarországról, Budakesziről 1946-ban gyermekként kitelepített politikus iránti tiszteletből kapta. Debreczy Zsolt gyűjtötte a magját Görögországban, Kamena Vurlában. Vastag, szinte fehérlően ezüstös hajtások, hatalmas, kúpos umbójú tobozok. Díszes, platánra emlékeztető kéreg. sűrű lucfenyőre hasonlító koronája szelet, havat bír, szárazságtűrése fantasztikus. Broad cylindrical habit, strong leading stem, long lateral heads. Sprouts rigid, resinous, fragrance, lots of drops of white resin. longitudinal gray, fibrous strips. Very fine specimen. Korkuteli török kisváros új városnegyedét díszíti. A száraz, télen hideg fennsík rossz talaján is robusztus növekedést mutat, vaskos hajtásain a pikkelyek „krokodil-mintázatúak”, törzse vörös-bordó-barna foltokban hámlik. A tall narrow vertical accent tree. Branches haphazardly pointing horizontally, carrying creamy gold colour maximized by the amount of sun available each day. A wonderful tree for a back drop in a large gardens or would make a spectacular screen or hedge. 5 metres high x 2 metres wide in 10 years in our Nursery/Garden. Cedar Lodge text. curtain-like as a Picea breweriana. Bark three colour, peel. Az "Eclipse" és az "Oval" testvére. Oldalvezérei merevek, vízszintesek, a tér minden irányába kinyúlók. Egymástól való távolságuk olyan, hogy a korona mindig áttekinthető marad, mint egy lucfenyőé. A másodlagos, vékony, fonalas, ezüstös hajtások ezekről lógva kicsit a Picea breweriana-ra emlékeztetnek, kérge ennek is díszesen, három színben hámló. Szoliterként különleges. create a rich drapery. Bark vine-red, and violet. Növényi költemény: oldalvezérei széles, lendületes ívvel döfnek az ég felé, másod-harmadrendű hajtásai túláradó ünnepi drapériákat formálnak – mindezt ezüstös-korall mintázatban, borvörös és lila színben pompázó törzs és vastagabb ágak kíséretében. as a Xanthocyparis nootkatensis ’Pendula’. Liptai István klónja. Erősen felfelé törő sudara, vízszintesen messze kinyúló oldalvezérei miatt habitusa inkább egy cédrusé, függönyszerűen csüngő másod-harmadrendű hajtásaival viszont a Xanthocypari nootkatensis ’Pendula’-ra emlékeztet, de mindeközben ezüstös-kék színben pompázik. typical semidesert cultivar. 6 meters in 25 years. Közepes méretű, kúpos alakú intenzív azúrkék szelekció. Tűző napra és száraz környezetbe való igazi félsivatagi növény. 25 évesen 6 méteres, fagytűrő a Z6 klímában. typical semidesert cultivar. 12 meters in 25 years. Hardy in Z6. Trunk is an other colourful wonder. Szokásos méretű, kúpos alakú intenzívkék szelekció. Tűző napra és száraz környezetbe való igazi félsivatagi növény. 25 évesen 12 méteres, fagytűrő a Z6 klímában. Törzse színpompás jelenség. seedling in the suburban Budapest. Egy 25 éves tömött, kék, kúpos szerkezetű arizonai ciprus magonca Budapest külvárosában, mely ellenáll a szennyezett levegőnek. A compact globose habit of seed, intensive blue coloured in full sun. Nice in smaller garden. 2-3 meters in 20 years. Hardy in Z6. Mesterházy text. Sűrű gömbforma, erőteljes kék színű. Kisebb kertekben is ültethető. 20 évesen 2-3 méteres, télálló a Z6 klímában. A little bit rustic globose habit without a leader, intensive blue coloured in full sun, branches are living their own life in short and dense way. Nice soliter in smaller garden or never cutted hedge. 3 meters in 25 years. Hardy in Z6. Vezérhajtás nélküli kissé rendetlen sűrű gömböc, napos helyen rikító kék színű, míg rövidhajtású vaskos ágai önálló életet élnek. Szép szoliter kisebb parkban vagy soha nem nyírt sövényként sokat tehet egy parkrészlet kiemeléséért. 25 évesen 3 méteres, télálló a Z6 klímában. dense upright habit. Needs full sun, summer heat. 4 meters in 30 years. Hardy in Z6. Egy újabb intenzív kék féltörpe fajta, az ’MPH Kék Álom’-nál rendezettebb megjelenéssel, de szintén gyorsan besűrűsödő ágrendszerrel. Teljes napfényt és nyári forróságot kívánó növény. 4 méter 30 év alatt, télálló a Z6 klímában. an unusual habit clone, like a Cedrus deodara. A növényt Mesterházy Zsolt találta a budapesti Roosevelt téren. Egy szertelen ágrendszerű, a himalájai cédrusra emlékeztető festői habitusú növényről van szó, amely normál növekedésű. Utóbb megtudtuk, hogy a Főkert szakemberei évekkel korábban több Észak-Amerikából származó arizónai ciprus magcsemetét ültettek ki városszerte (Vinis Gizella OMMI osztályvezető szíves közlése nyomán), amelyekből még ma is látható néhány példány. Az egyik az Erzsébet-híd budai lehajtója mellett áll – 30 éve dacolva a benzingőzzel. Sivatagi növényt a városi sivatagba. A Gresham szálloda építkezése miatt az anyanövényt eltávolították, így az Orlóci László által korábban szaporított utódokból maradt fenn pár példány. Megj. Hódi: Az Erzsébet –híd budai hídfőben nem egy, hanem két példány van, egyik a lehajtó „hurokrészében”, ez inkább zöld (Cupressus arizonica ’MPH Zöld’), a másik a Városmajor és a Balaton felől érkezőket egyesítő torkolat előtt kb 20 méterre, Utóbbi kisebb, néhányszor visszafagyott fiatalon, mostmár szívós és erősen kék színű. Ezekkel szemben, a pesti oldalon is magaslik egy a rakparttól kicsit beljebb lévő parkban, a római kori leleteket őrző tárlók közelében egy kiemelt border néhány négyzetméteres „szigetén”, beton szegéllyel. An incredible giant arizonica from the Lake Balaton shore. 20 meters in 30 years, fastigiate habit, blue colour, extremely vital sitting in ground waters. Hey people, Cupressus arizonica likes water, not only droughts! Hihetetlen lelet a Balaton partjáról ez az óriás arizonai ciprus. 20 méter 30 évesen, oszlopos jellegű, kék színű és különösen jól érzi magát a balatoni talajvízben. Végre egy ciprus, amelyik imádja a vizet, nemcsak a szárazságot tűri! in the downtown of Budapest. Resistent of polluted air. Egy 30 éves amerikai eredetű zöld ciprus Budapest belvárosában, mely ellenáll a szennyezett levegőnek. resinous. Bark gray, vertical streaked. A Cupressus arizonica rokona, de jellegzetesen eltér tőle. Lombozata szürkés mattzöld. Oldalvezérei másod, -harmadrendű elágazásokat hordoznak, utolsó éves hajtásai „csomósak”, gyantacseppesek, kérge szürke, hosszanti csíkos. A magot Kiss Ferenc, Amerikában élő magyar gyűjtötte a 91-es út mellett Kaliforniában. bended. Fast growing, 17 years old, and 8 m high. Bark is a red-brown patchwork. Debreczy Zsolt maggyűjtése az arizonai Oak Creek Canyon-ból. A sokféle küllemű magonc közül ezt a lazább hajtásrendszerű, némileg bókoló vezérű és oldalvezérű, kékben játszó példányt választottuk ki. Törzsén a kéreg vörösbarnás foltokban hámló. Széles kúp, 17 évesen 8 méteres volt. Az „Eclipse” és a "Line" testvére ugyanabból a szelekcióból. Hajtásrendszere felfelé törő, dúsan elágazó, rendkívül sűrű, fonalas, vékony, kékes-ezüstös. Ez a szövedék akadályozza meg, hogy a hó szétnyomja, a szél megbontsa. Alakja 3 méteres koráig kúpos tojás, később is csak lassan szélesedő henger. Kérge, mint a ’Line’-é. The mother plant was destroyed in 2008.
a gardening school in Budapest. A nutans type clone. koronát nevel, de cserébe csodálatos szoliterré válik. Szinte vakítóan ezüstös-hamvas, éves hajtásainak leomló függönye lélegzetelállító. Robusztus megjelenés, gyors növekedés jellemzi. Korkuteli TUR extrém klímájában áll helyt. A new variegated form of Arizonia Cypress. Plant grows in a pyramidal habit with blue and cream foliage. Plant found as sport at Stanley & Sons Nursery, Inc. Boring, Oregon around 1999. Stanley text. in the gardens to be seen well. Sugárzó mélykék jelenség, mely erőteljesen növekszik – neve szerint a báltermek Nagyasszonya lehetne – és illő szabad helyet igényel a kertben, hogy szabadon csodálhassák. Square Park in Budapest HUN /former cv. ’Roosevelt’ (id. Ilyen szín nincs is! Karácsony előtt fehérre befújt kis fenyőkre hasonlít legjobban, de színárnyalata mégis inkább az ezüstmetálhoz közelít. Mindehhez robusztus növekedés, hengeres habitus, vízszintesen vagy enyhén ívesen kifelé álló oldalvezérek, sokáig teljesen áttekinthető korona-struktúra társul. Szülője a budapesti Roosevelt téren, a Lánchíd pesti hídfőjében lévő parkban állt /Széchenyi/, míg a tér alatti mélygarázs kedvéért az egész park régi növényeit el nem pusztították. An evergreen conifer with sprawling pendulous branches. Usually grown as a staked, small weeping tree. Foliage is a brilliant silver blue. Prefers full sun in well-drained soil. If staked, 8' tall x 5' wide in 10 years. Hardy to -10 degrees. USDA zone 6. Buchholz text. 1 méteres 15 éves korában. Blue grey, narrow to medium width, fast growing tree with open branch habit, tips weeping. 3 - 4 metres high x 2 metres wide in 10 years in our Nursery/Garden. Zone 7. Cedar Lodge text. Stretched conical crown, quickly growing. Bark with red and vine-red patches.On upper part of crown many in a straight line standing leaders, down the foliage outgrows and shall egg-shaped. Cones with conspicuous bracts. Megnyúlt kúpos korona, györs növekedés jellemzi. A kéreg vörös és bordó foltos. A korona felső részén számos egyenesen álló oldalvezér van, lejjebb ezeket a lombozat túlnövi és a korona tojásdaddá válik. A tobozok pikkelyköldöke feltűnő. A little tree with like storcknest-form crown. Very slow without leader. Dense coral figured branchlets in strong silvery colour. Biggest atraction is the trunk: bark in very intensive purpur, strongly peeled, like a Juniperus occidentalis. Light and airy, unlikely phaenomen. Kis fa, gólyafészek-szerű koronával. Nagyon lassan nő, sudara nincs. Sűrű, korál-mintázatú hajtásai vannak erősen ezüstös színben. A legnagyobb atrakció a törzs: a kéreg nagyon intenzív bíbor színű, erősen hámlik, mint a Juniperus occidentalisé. Légies, valószínütlen jelenség. brown patche. Massive, silverly sprouts, dense, rich branches. Very large, handle cones. Drought tolerant, hardy. Original plant in Arizonica Arboretum, Csákvár, HUN. A Pécsi Tudományegyetem arborétumában korábban élt növény magonca. Meggypiros, foltos kérge, dús, sűrű, ezüstös koronája, hatalmas, szarvakkal díszített tobozai nagyon impozáns növénnyé teszik. Igazi szépség, igazi ritkaság. From sport of a specimen in Antalya, Atatürk Parki, TUR 2006. Slow growing, maybe 40 years old tree approximative 6 meters tall. Crown regular conical, closed, dense, thick. brown, patches fall. Dramatic phenomenon. Lassan nő, a körülbelül 40 éves fa 6 méter körüli. Koronája szabályos kúp alakú, zárt, sűrű, tömött. A hajtások rövidek, nagyon sűrűek, mint egy korall vagy párnásak mint a Ch. obtusa „Plumosa” típusok, színük nagyon erős kékes-ezüst. A kéreg erősen foszlós, hámlik, színe intenzív vörös-lila-barna, foltokban hullik le. Drámai jelenség. A columnar variety of Arizona Cypress. Plant grows in a columnar cylinder with sulfer-yellow coarse foliage. Grows very fast but can be cut or pruned. First found in France. Stanley text. Tízévesen kérge még mindig sima, hamvas szürke / mint egy Abies/, ágai, hajtásai csavarodottak, mint a mandzsu fűz - ezüstös lombozattal. Sudara már nem kifejezett, több, felfelé törő oldalvezér konkurál vele. Tobozai szarvnélküliek, megnyúlt oválisak, nagyok, szürkésbarnák, fényesek, nem hamvasak. leaves from the second year. 1m in 10 years. Ez a kék törpe ciprus horvát eredetű magvetésből származik. Különlegessége, hogy a friss hajtások a második évtől besűrűsödnek. 10 évesen 1 m magas. Loose silvery foliage, slender conical habit. Bark very strongly peele, colour purpur-brown and violet. Quite juvenile plant produce cones, especially on stamm. The cones have large umbos, this is why cones are „angled”. Serotinus, for many years without opening. Laza ezüstös lombozat, keskeny kúpos korona. A kéreg nagyon erőteljesen hámlik, színe bordó-barna és lila. Már az egészen fiatal növény tobozokat hoz, nagymértékben magán a törzsön. A tobozok hosszú évekig nem nyílnak fel /serotinus/, nagy köldökűek, jellegzetesen „szögletesek”. Seydisehir törökországi város a Taurus hegységben /1300 m./ A rendkívül szeles, télen igen hideg helyen a buszpályaudvar parkolójában élő növény virító ezüstszínű, ívesen kihajló oldalvezérei hosszan elágazás nélküliek, felfelé törők, ettől a növény olyan bizarr alakú, mint a Juniperus chinensis ’Kaizuka’. Entangled conical crown, saturated yellow colour. Branchlets slighty pink, later gray. Cones with big umbos. Trunk vigorous, bark gray, powerful scales. In full sun foliage also not scorching. Curious patchwork in a green environs. Kusza kúpos korona, telített sárga lombszín jellemzi. A hajtások először enyhén rózsaszínűek, később szürkék. A tobozoknak nagy köldökük van. Erőteljes törzs, a szürke kéreg erősen hámlik. A lomb tűző napon sem perzselődik. Érdekes színfolt egy zöld környezetben. lemonade shape in strong growing periods. Z6. Fakókék ciprus enyhén oszlopos alakkal, a gyorsabb növekedésű időszakokban világos színt ölt. Z6. Narrow conical habit, the bark for long time smooth, gray, later fissured, yellowish-brown. Dense foliage, first time fresh-green, older parts slow turn silver. Male cone flowers pale-green. Cones ovoid with very little umbos. Continous two coloured foliage very unusual, remarkable show. Keskeny kúpos koronájú, a kéreg sokáig sima, szürke, később repedezett, sárgásbarna. Lombja sűrű, először üdezöld, az idősebb részek lassan ezüstössé válnak. A hím tobozvirágok halványzöldek. Tobozai oválisak, nagyon kis köldökkel.A folyamatosan kétféle színű lomb nagyon szokatlan, érdekes látványosság. C. macnabiana var. bakeri /Jeps./Jeps. ssp. MATTHEWSII Wolf 1948 USA CA, Siskiyou Mts. Broad conical habit with dense foliage. Strong silvery colour, characteristic that resin drops in serried lines, touch is sticky and with intensive sweet-smell. Big cones have large resin-blisters. Branchlets dark reddish-brown, later gray. Vigorous, competitive, robust. Széles kúpos koronájú sűrű lombozattal. Erőteljesen ezüstös lombja van, jellegzetessége, hogy a gyantacseppek elborítják, érintésre ragadós és intenzív édeskés illatú. A nagy tobozok nagy gyantajáratokkal rendelkeznek, kitüremkednek. A hajtások intenzív vörösesbarnák, később szürkék. Életerős, alkalmazkodó, robusztus. Páfránymintázatú, ezüstös lombú, tobozai hengeresek és egészen teljes beérésükig, vagyis két-három évig - a szarvak vége kivételével – élénkzöldek. Bizarr látvány egy enélkül is szép növényen. Conical habit, normal growth, silverly-gray foliage. On brachlets many resine drops, axis of last spray red-brown. Cones in first year big, globous / 2,5 – 3 cm diameter/ with many protuberances, almost white and bloomy, later gray. Many years remains /serotinous/. Bark wine-red and dark brown, glabrous. Átlagos növekedésű, kúpos koronájú. Lombja ezüstös szürke. Hajtásain rengeteg gyantacsepp van, az utolsó éves hajtás tengelye vörös-barna. Tobozai nagyok, gömbösek /2,5-3 cm átmérőjűek/, sok kidudorodással, majdnem fehérek és hamvasak, később szürkék. Több évig a fán maradnak felnyílás nélkül. A törzsön a kéreg bordóvörös és sötétbarna, sima, kis foltokban hámlik. Nagyon finom, nagyon vékony, sűrű, ecset-szerű lombozattal, hamvas-kék színnel, apró, 1 cm-es kerek, fényes tobozokkal, lassú növekedéssel jeleskedik. Éppoly szívós, mint az alapfaj. Szép szoliter vagy nagyobb sziklakert lakója is lehet. opposite one each other, but shift along the axis. Habitus, korona, kéreg, hajtások nem különböznek a típustól. A tobozok viszont nagyok, 4-5 cm hosszúak, szürkék, fényesek, hengeresek. A tobozpikkelyek gyakran nem párosával egymással szemben, hanem a toboztengely mentén egymáshoz képest eltolva helyezkednek el, hegyesek, jellegzetesen nagyok, kiállók. Very robust growth, broad conical habit. Bark in youth. sticky foliage because resin drops. Gyorsan széles, ezüstös, illatozó kúppá növekszik – a kert királynője. Kérge fiatalon szürke és sima, később repedezett, barnásszürke. Pikkelyleveleit gyantacseppek díszítik, ettől sűrűn pontozott, ragadós. Rendkívül szárazságtűrő, teljesen télálló. Széles kúppá növekszik, átlagos tempóban. Hajtásai páfrányszerű síkokba rendeződnek, fiatalon kígyó vonalban, később kiegyenesedve növekszenek. ettől „mesebelivé”, légiessé válik. Lombozata kékes-ezüstös, tobozai alig 1 centisek, fényesek, szarvacskásak, a Cupressus macnabiana-ra emlékeztetők. Kérge sokáig sima, szürke, később repedezik, barnás mintázatúvá válik. Szárazság- és hidegtűrő. striped.gray. Drought tolerant and full hardy. magasságához képest keskeny kúp. Sudara és fiatal hajtásai kígyó vonalban tekergőznek, a harmadik éves vesszők már egyenesek. 2-3 cm átmérőjű, a gyantajáratoktól rücskös tobozai vannak, már fiatalon terem. Kérge fiatalon szürke, később mélybarna, szürke mintázattal. Gyors növésű, teljesen klímatűrő és rendkívül szárazságtűrő. A Mesterházy Pinetum egyetlen életben maradt ciprusa, ahol a -25-30 fok rendszeresen előfordul. Cupressus cashmeriana - Kashmir Cypress. The correct name of this plant seems to lean towards Cupressus torulosa var. cashmeriana. The most beautiful of all Cupressus. Graceful, weeping branchlets. Needs extremely good shelter to look its best. Erect and pyramidal. 5 metres high x 2 metres wide in 10 years in our Nursery/Garden. Zone 6. Cedar Lodge text. C. funebris var. glauca Mast. Cupressus pseudohimalaica Silba 1994 (Farjon 1998). plant. Little scales and juvenile needles a long time together. frost as others, needs protect and sheltered place. Horvátországban, a Velebit magaslatain átkanyargó út pihenőjében talált Debreczy Zsolt. Az oltvány az átlagosnál hidegtűrőbbnek bizonyult, máig él Buda egyik déli lejtőn elhelyezkedő kertjében. A lenge, ezüstös kék fátyolként leomló lombozat a csodája ennek a fiatalon általában fagyérzékeny ciprusnak. Szélvédett, jó mikroklímás kertsarokban hosszú életű lehet. A greeny-silvery, at age darkgreen, hanging type selection. to survive in Z6, more than the blue selections. Talán kevésbé álomszerű, mint kék tipusai – bár a leomló, függönyszerű hajtásrendszere ennek is „a helyén van” – viszont télállósága jobb. A zöld tipusok inkább Bhutan vadregényes vidékein fordulnak elő. Várhatóan keményebben áll ellen a rigorózus teleknek, mint az eddigi kék próbálkozások. A somewhat mysterious plant, beautiful in a semitropical garden, tall and slender with an open tiered habit and slender weeping feathery branches cloaked in delicate bluish gray foliage. Strangely enough it is not known in the wild. Arrowhead text. C. sempervirens Franch. non L.
sprouts slighty hang. Certain remind habit of C. funebris. A Kunmingi Botanikus Kerttől kapott magból Liptai István nevelte Tokajban. Mélykék, de viaszosan hamvas, nagyon finom, ecsetszerű, „páfrányos” hajtásai adják könnyed, légies megjelenését. Némileg, az enyhén ereszkedő ágai miatt a C. funebrisre emlékeztet. Tobozai 2 centisek, kerekek, fényesek. Nagyon szárazságtűrő és télálló. Cupressus funebris - Chinese Weeping Cypress. Formerly Chamaecyparis funebris. Native of China. This species always has a straight trunk. 5 metres high x 2.5 metres wide in 10 years. Zone 8. Cedar Lodge text. Cupressus gigantea - Tsangpo River (Brahmaputra in Tibet) Cypress. Nice pale blue as seedling. Very fast growing in first year. More assessment necessary from observations in our nursery/garden. Very narrow as a 2 year old tree. Rushforth comments that the trees in native habitat are up to 15 metres tall, with a very narrow columnar in habit. Foliage in flat sprays. Found growing either side of the Tsangpo River. Trees were coppiced at 6 metres high. No trees grew where serpentine rock outcrops appeared. It is Hardy - (we will test the hardiness for salt). 3 metres high x 1.7 metres wide in 5 years. Zone 7. Cedar Lodge text. aberrations /bony scales on back a dinos/. Hazája Tibet, a száraz hidegek hona. Vékony hajtásai sűrű szövedékké állnak össze, szürkés-hamvas kúpként magasodik, szél, hó nem tesz kárt benne. Nincs másik ilyen külalakkal bíró fenyőféle. Tobozai ennek az egyednek aprók, ehhez képest nagy szarvai között viszont egészen beérésig virító zöld csúcsos kinövések díszítik, mint egy ősi dínó hátát a csontpikkelyek. Kúp alakú növény lassú növekedéssel. Hajtásai gyakran „páfrányosak”, egy síkba kiterítettek, halványzöldek ezüstös „érintéssel”. A hajtástengely rózsás árnyalatú, hamvas. umbos like Cupressus goveniana Cornuta. Lassan növekszik, teljesen szabálytalan koronát nevel. Még mindig nem pikkelyleveleket, hanem tűket növeszt, rögzült juvenilis alak. Lombozata sápadt olajzöld, töbozai fényes barnák, hosszú, hajlott köldökkel, így a Cupressus goveniana Cornuta fajtára hasonlítanak. Az évek, sőt most már évtizedek múlnak, ez a növény meg éppoly fiatal, mint kis korában: még mindig fiatalkori tűleveleket hoz, melyek sprőd „bundaként” burkolják. Színe matt sötétzöld, tobozain nagy szarvak meredeznek. habitus. A hajtások fonalasak, csomósak, a tobozok nagyok, erős, hegyes dudorokkal, szürkésbarnák. A kéreg szürke, bordázott. Az Arizonica Arborétumban ez volt az első ciprusféle, amelyen megjelentek a madárfészkek. Szárazságtűrő, télálló. cones. Hardy and unusual drought tolerant. Mint egy széles hasú fényeszöld tojás. Fonalas, csomós hajtásain hamar megjelennek a fényesbarna, majd matt barnásszürke gömbös tobozok. Kalifornia télálló, szárazságtűrő küldötte. foliage, globose, bright brown, little cones, umbo insignificant. Gyors növésű, kúpos koronájú növény erőteljes sudárral, ostorszerű, hosszan kinyúló, ives oldalvezérekkel. A lombozat mattzöld, a tobozok kicsik, kerekek, fényes barnák, beérve szürkék jelentéktelen szarvakkal. A kéreg fiatalon sima, szürke, később szalagokban foszló.. Kitűnő szárazságtűrő és teljesen télálló. Narrowed, conical habit, quickly growth. Dense, shiny dark green foliage, many long, lash-like branchlets. For many years no cones. Bark a long time smooth, gray. Keskeny kúp alakú korona, gyors növekedés jellemzi. Sűrű, fényes sötétzöld lombozat, rengeteg hosszú, korbácsra emlékezető hajtása van. Még mindig nem terem /2012/, kérge sokáig sima, szürke. 2000 Hódi Tóth József HUN from seed of Bob Graeton Co.
Bob Graeton kaliforniai magkereskedőtől vásárolt magból, melyet Kalifornia, San Mateo County gyűjtési hellyel jelölt és C. goveniana var. abramsiana-ként érkezett. Fiatalon keskeny hengeres növény, ívesen felfelé törő oldalágakkal, kifejezett sudárral. Lombozata fénytelen mélyzöld /már ebben is hasonlít a C. sempervirens egyes tipusaira/. A hajtások fonalasak, csomósak, a fiatal növény ritkás hajtásrendszerű, a kéreg sima, szürke. /Idősen mélyen bordázott, foszló, szinte fehér-szürke./ A toboz nagy, hengeres, az umbo jelentéktelen, nagyon hasonlit a C. sempervirens-re. Első évben a toboz felfelé áll, mint az Abies –tobozok. Seed received as C. goveniana var. abramsiana. umbo very sharp. Bark frayed, grey. Hardy in Z6. Original plant /seedling/ in a Budapest private garden. 2010-ben 8 méteres, széles kúp alakú növény. Sűrű, matt mélyzöld lombozatú, hajtásai vékonyak. A tobozok aprók, csak 5-7 mm átmérőjűek, rajtuk az umbo hegyes, erősen kiemelkedő. Kérge foszlós, szürke. Télálló. Anyanövény / magonc/ egy budapesti magánkertben. Stiff lateral heads, upright, conical habit, bizarre soliter. Mereven kiugró oldalvezérek, magasba törő kúp, lombja matt mélyzöld, kérge hamar szalagosan foszlóvá válik, de előbb sima, szürkésbarna. Kerekded, de a hegyes szarvak miatt szögletes tobozok. Bizarr szoliter. C. macrocarpa var. guadelupensis /Wats./Mast. C. corneyana Franco non Carr. C. cashmeriana Royle ex Carr. C. corneyana Hort. non Royle ex Carr. C. lindleyi Klotzsch & Rehd. A blue round shrub of Mexican Cypress. Leaves are awl like on a round squatty plant. Leaves a blue-green color. Grows about 6-8 inches a year. Stanley text. peels. A light veil for fairyes. Feltörő, kúpos korona, ezüstös kék lombozat, erőteljes, vaskos hajtások tömege. Mindehhez masszív, borvörös kérgű, erősen hámló törzs társul. Mégis, a növény egésze egy könnyed fátyol benyomását kelti, mely tündérek számára készült.